First symptoms may be seen at the age of 1,5 years. Areas under pressure (saddle, etc.) are particularly affected, and the skin traumas heal very slowly. Affected horses are usually euthanized due to poor quality of life. Defect in the connective tissue results in skin splitting, tearing and separating from underlying layers. → Only animals with two copies of the genetic variant (herda/herda) are affected. Animals with only one copie (N/herda) are clinically normal carriers. N/N normal. The horse has not copies of the genetic variant causative for HERDA and therefore cannot pass it on to its offspring. N/herda a carrier. The horse is clinically normal. The genetic variant causative for HERDA will be passed on to its offspring with a probability of 50%. herda/herda affected. If the horse lives long enough to reproduce, the genetic variant causative for HERDA will be passed on to all offspring. All offspring will be clinically normal carriers (N/herda). Carriers may be bred to normal animals (N/herda x N/N) without any risk of producing affected offspring. The offspring should also be tested before breeding to determine if they are carriers or normal. Breeding two carriers (N/herda x N/herda) is not recommended due to the possibility of 25% of the offspring being affected. Affected animals (herda/herda) should not be used for breeding. Testinformation: This test detects a single basepair change in exon 1 of the Peptidylprolyl Isomerase B (PPIB) (or Cyclophilin B) gene. Tryon RC, White SD, Bannasch DL. 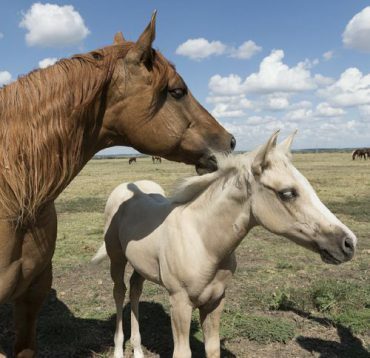 Homozygosity mapping approach identifies a missense mutation in equine cyclophilin B (PPIB) associated with HERDA in the American Quarter Horse. Genomics. 2007 Jul;90(1):93-102. DOI: 10.1016/j.ygeno.2007.03.009.